ISR-affiliated Professor William S. Levine (ECE) and ISR Visiting Researcher Dr. David Elliott will be among the speakers this week at a memorial conference for the late Wijesuriya Dayawansa, a former ECE and ISR professor. Dr. Elliott was Dr. Dayawansa's Doctor of Science advisor. 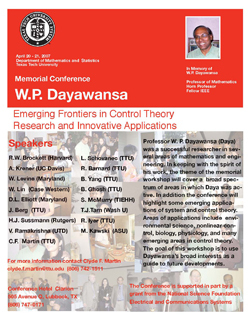 The conference, "Emerging Frontiers in Control Theory Research and Innovative Applications," is being held April 20-21 in Lubbock, Texas, where Dr. Dayawansa was a Texas Tech mathematics professor until his death last October. From the conference program: "Professor W.P. Dayawansa (Daya) was a successful researcher in several areas of mathematics and engineering. In keeping with the spirit of his work, the theme of the memorial workshop will cover a broad spectrum of areas in which Daya was active. In addition, the conference will highlight some emerging applications of system and control theory. Areas of applications include environmental science, nonlinear control, biology, physiology, and many emerging areas in control theory. The goal of this workshop is to use Dayawansa's broad interestes as a guide to future developments." Dr. Dayawansa was an ISR and ECE faculty member from 1989 to 1996. He then moved to Texas Tech, where he was Paul Whitfield Horn Professor of Mathematics and Statistics. He was a specialist in nonlinear control systems, especially in smart structures and walking machines.